In-demand Eintracht Frankfurt striker Luka Jovic hopes to show Benfica what they are missing when he faces his old club in Thursday's Europa League quarter-final clash in Lisbon. Jovic joined Frankfurt on-loan two years ago after being made surplus to requirements at Benfica. But the 21-year-old has blossomed beyond all expectation in Germany, and is now coveted by Europe's top clubs. "Luka is a real goal machine," Frankfurt coach Adi Huetter told Austrian newspaper Kleine Zeitung on Tuesday. At Benfica, Jovic was banished to the reserve team for disciplinary reasons. It has been a different story at Frankfurt, where he has scored 17 goals in 26 league games this season to keep his team on course for a top-four finish. He scored his seventh Europa League goal at San Siro last month to knock out Inter Milan and set up a last-eight rendez-vous with his former club Benfica. "As soon as Luka found out that we were playing Benfica, you could see how happy he was," said Huetter last month. "To go back and play somewhere where you didn't make it gives you extra motivation." Although Jovic is still officially a Benfica player, the Portuguese club cannot hope to profit indirectly from the Serbian's success. His loan deal allows Frankfurt to sign him permanently for under 7 million euros ($7.9m). A much smaller fee than what Europe's top clubs could offer for him. "Obviously teams like Real Madrid, Barcelona, Bayern Munich and Manchester City are angling to sign him," coach Huetter told Kleine Zeitung on Tuesday. "It's normal that the big clubs want to fish in our pond." 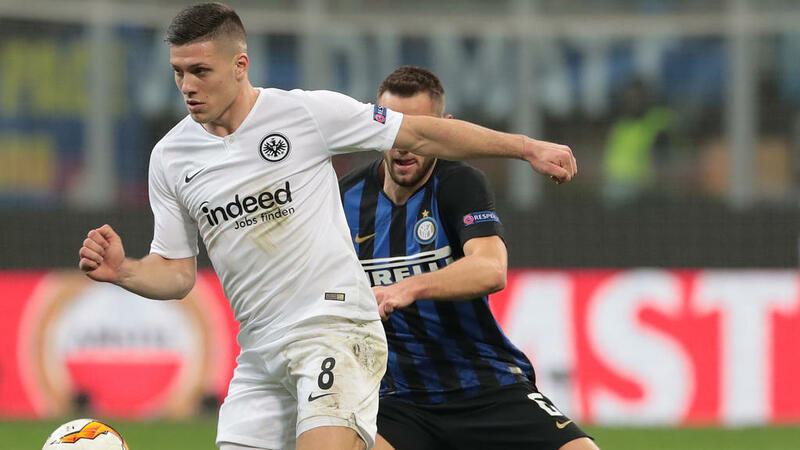 For now, however, Jovic hopes to stick it to his former club and move Frankfurt a step closer to the Europa League final in Baku. If Huetter's side do get that far, it may scupper their plans for a post-season marketing tour in Asia. Frankfurt are scheduled to play fellow Bundesliga side Wolfsburg on a week-long trip to China between May 22 and 27. Yet with the Europa League final scheduled for May 29, their plans may change if Jovic fires them to European glory.